If there's anything more nerve-racking than a first date, it's a job interview. But as is the case with either scenario, you can quickly get your jitters under control by wearing something that makes you feel your absolute best—after all, confidence is key in situations where you want to put your best foot forward. While we've already rounded up a handful of first-date outfits that are sure to impress, today, we're homing in on simple and chic winter interview outfits that will certainly leave a lasting impression on your potential employer. You've already got a winning résumé, and now you'll have a winning ensemble to go along with it. From the always classic blazer-and-skirt combo to a power suit that shows you mean serious business, these are the outfits to copy the next time you get called in for an interview. Good luck! A great winter interview outfit? 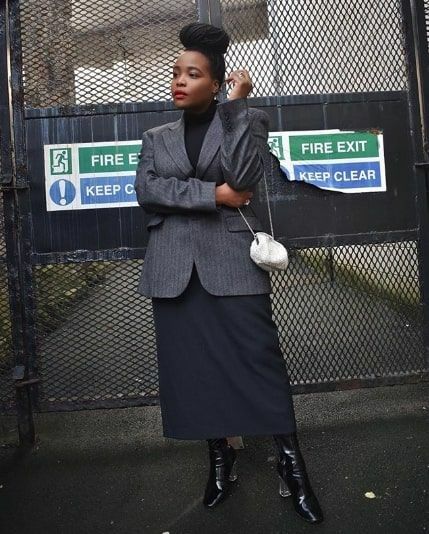 A black skirt, sleek turtleneck, and gray blazer. You can't go wrong with an all-black look. Wear your favorite trousers and heels. A trendy yet interview-appropriate look: a cool blouse and high-waisted trousers. A wrap blouse always looks cool. Go for a plaid power suit. Or one rendered in a more fall-friendly fabric, like corduroy. Black and white is a foolproof interview color combo. White trousers are always a great go-to. If you're not feeling pants, try a midi-length dress and boots. Up the cool factor of a basic blouse by wearing it over a turtleneck tee. This look proves you're ready for serious business. A blazer is a great go-to for a winter interview. A fun yet elegant wrap blouse you can wear for your interview as well as for a night out. Scoop up these heels ASAP. How pretty is this satin midi dress? Plaid pants are a must-have. Wear this midi skirt with a simple black top and ankle booties. Looking for something else? We’ve got more interview outfits where these came from.